Get expert insight into the latest life-saving techniques and procedures from leaders in equine neonatal medicine. 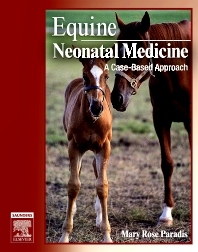 This outstanding textbook and clinical reference takes a case-based approach to the basic pathophysiology, diagnosis, and treatment of disease in the newborn foal, along with neonatal pharmacology, nutrition, assessment, and high-risk pregnancies. Features the latest advances in equine neonatology that have the potential to significantly increase the survival rate of critically ill foals. Provides thorough coverage of both basic concepts and hot topics in the field, including pathophysiology, and diagnosis and treatment of disease in the newborn foal, along with information on nutrition, assessment, and high-risk pregnancies. Case-based chapters use real-life scenarios to help the reader apply key concepts to actual practice. Expert contributors are leaders in the field of equine neonatal medicine and ensure the accuracy and clinical relevance of all information.